The Outer Limits, a.k.a. Loop 4, trail is part of the County Line Nordic Area in the Grand Mesa National Forest between Delta and Grand Junction, Colorado. 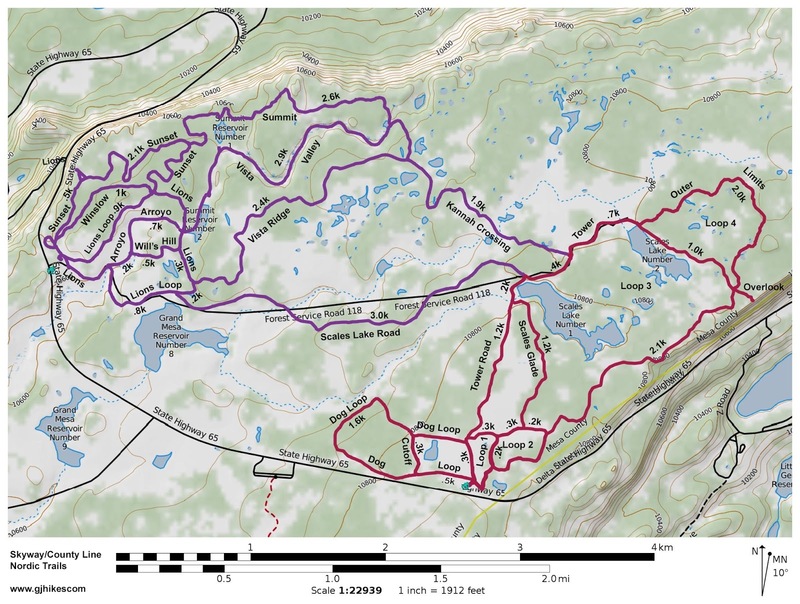 The trail is located about 2 miles from the trailhead where there is an optional out-and-back that leads to an overlook along the rim above the Island Lake area. 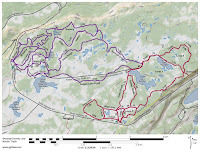 The Outer Limits trail by itself is an ungroomed backcountry trail through the trees that is 1.2 miles in length. The trail begins and ends off of Loop 3. The County Line Nordic Area is located on the Grand Mesa where the Mesa/Delta county line crosses Highway 65 near mile marker 30. For this post we are following the Loop 3 route counterclockwise to get to the Outer Limits trail by taking the right fork at the trailhead. Take the right fork at each intersection that comes up following the signs for the Overlook and Loop 3. Just before the 2 mile point there is another intersection where Loop 3 turns to the left and the short spur that leads to the Overlook branches off on the right. The Outer Limits trail begins right behind the trail marker at this point. The ungroomed trail might be a little hard to find at first if there aren't any fresh tracks in the snow. In that case look for the Outer Limits trail marker with the big '4' on it right where the trail disappears into the trees. It's nice when there are tracks to follow as long as you can be sure that they are going in the right direction. Fortunately for that the route is marked with blue diamonds. There are some stretches of trail where the distance between the blue diamonds is far enough that you might be unsure whether you are still going the right way. At those times you might be able to look back over your shoulder and notice markers for people that are going in the other direction. There are a few minor hills along the way but the biggest drop is less than 10 feet and not real steep. Forethemostpart the changes in elevation are nice and gradual. The solitude of the Outer Limits trail is a true backcountry experience. The thing about blindly following someone else's tracks is when they suddenly split with one set going one way and the other set going another direction. We were able to pick the correct route by matching our GPS track up with the outline of the trail on the map that we were carrying and after going in that direction for a short distance we spotted another blue diamond that confirmed our choice was the right one. There are only a couple of places where the Outer Limits trail travels out in the open and is exposed more fully to the elements. That said, you can probably get a lot more snow dumped on you that falls off of the trees than what might be blowing around or falling from the sky. The Outer Limits trail comes to an end after a fun 1.2 mile romp through the woods and rejoins Loop 3. For this post we continued on around Loop 3 toward the radio tower to get back to the trailhead. It is about a quarter mile shorter going this way and since that part of Loop 3 is easier it is a lot faster. The Outer Limits trail is a good choice for those that are looking for something that is much more primitive than the other nicely groomed trails in the County Line Nordic Area but still has a marked route to follow (even though the groomed trails are exactly why most people come to County Line and Skyway). Outer Limits requires a little more advance preparation before attempting it. We recommend taking a map and if at all possible a GPS. The GPX file that you can download at the top of this post includes all of the County Line and Skyway trails to make things easier. We skied the Outer Limits trail when we took the photos for this post but we have also snowshoed it before and that was great also. If you would like to see it for yourself then all you have to do is 'Take a hike'.